The Aurora 888 Marte is the third release in Aurora’s Stellar Collection after the exceptionally well received 88 Nebulosa, and 88 Sole. Aurora has taken inspiration from the planet Mars for its latest limited edition fountain pen. Mars is often referred to as the Red Planet because the reddish iron oxide prevalent on its surface gives it a reddish appearance that is distinctive among the astronomical bodies visible to the naked eye. Mimicking the planet’s red surface, the 888 Marte is made of marbled red Auroloide with rose gold-plated details. The Aurora 888 Marte is made entirely in-house, including the nib and ebonite feed which are outsourced by most pen companies. The cap and barrel are made from red Auroloide while the cap’s finial, grip section, and piston knob are made from black resin. All the metal trim is plated in rose gold to match the solid 18k rose gold nib. The nib is available in six widths: EF, F, M, B, BB, and Factory Stub. Aurora’s nibs are excellent candidates for customization from a simple Tune & Smooth to any custom grind, all of which are included at no additional charge! Each Aurora 88 Marte fountain pen is engraved with its limited edition number out of 888 on the top of the cap, opposite the clip. 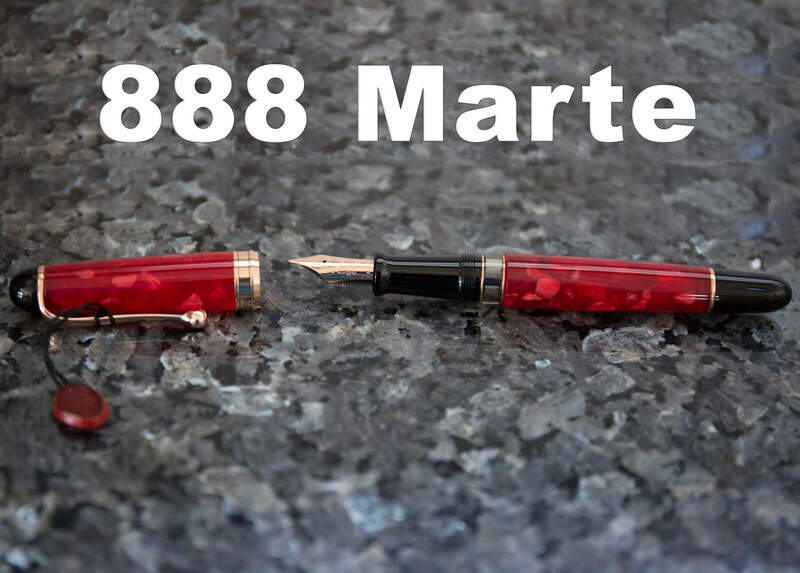 Like all 88s, the 888 Marte features Aurora’s unique piston filler design with a built-in ink reserve. When the pen runs dry, extend the piston to access enough ink for several more pages of writing. The piston knob will remain extended acting as a reminder to refill the pen while still allowing the cap to be posted.